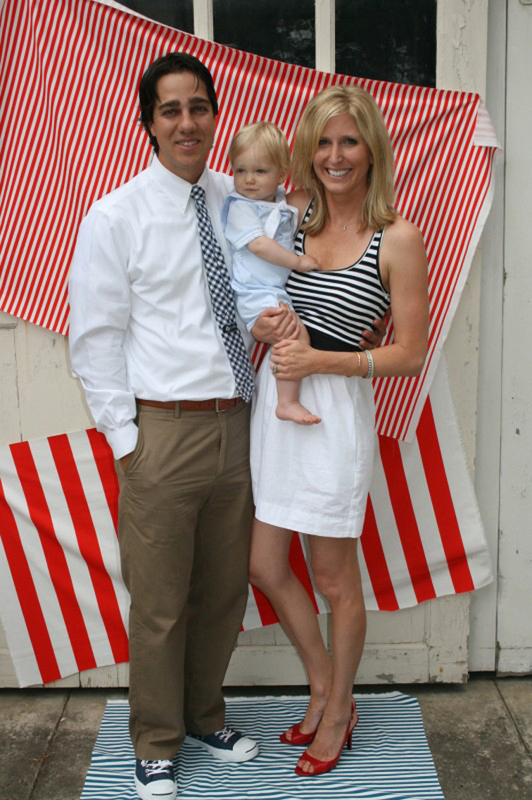 Let’s start with Brooks’ first birthday. Well, he actually had to share his first birthday with Brett. Brett was graduating from business school the same weekend Brooks turned one, so we had a “Brett is Done & Brooks is One” party for the pair of them. Before heading to grad school Brett was in the Navy and we all grew up by the beach so the sailor thing is in our blood. And since both boys were taking new voyages… Brett into the real world, and Brooks into life as a 1 year old, we thought the theme was perfect. 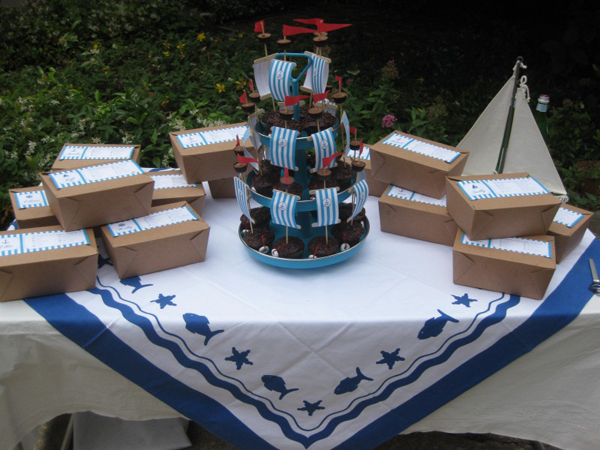 The nautical flags hanging above the table are from Land Of Nod, the fabric on all the tables and for the photobooth area was from Ikea (don’t they just have the most smashing fabric? 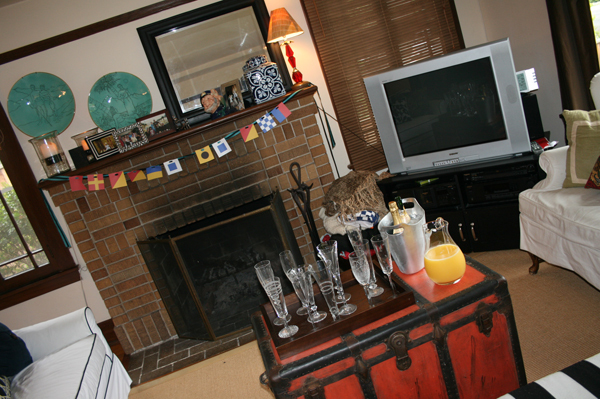 ), and all the boat/lighthouse/nautical tchotchkes on the tables are straight from my mom’s house. 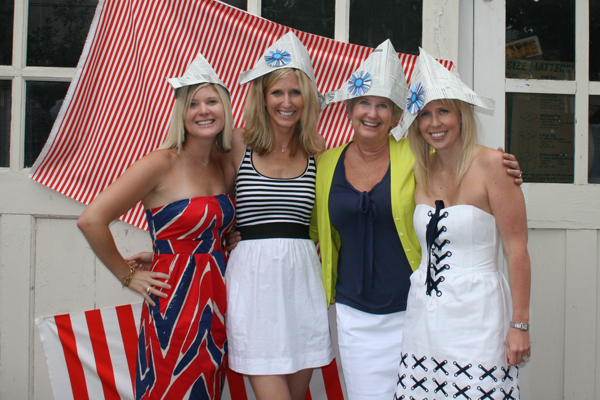 Like I say, the beach is in my DNA, so it’s totally fabulous when you can repurpose things you (or your mom!) already own for a party! We were about a week away from moving so we tried to keep this party pretty mellow. Looking back at this now, I would have LOVED to put a carpet under the table to hide the hideous cement between our house and the house next to us. 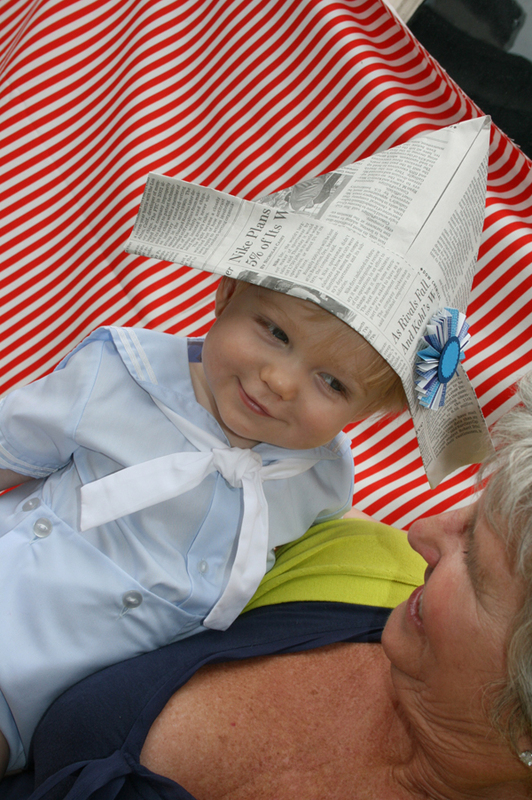 The biggest hit of the day were those paper hats. My mom whipped those suckers up in a matter of minutes and made the darling little paper badge deal as well. (Is it sounding to you like this blog should be named “my mom likes a party?” Yeah… to me too.) 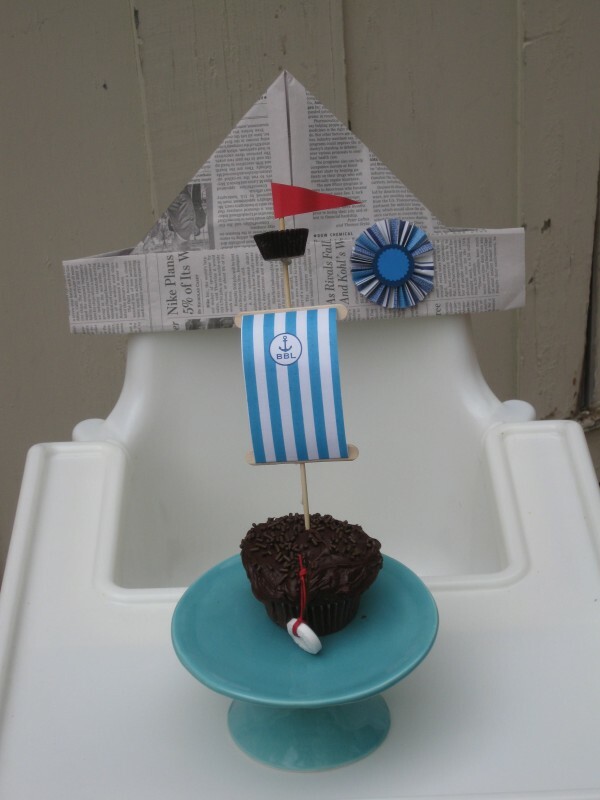 The idea for the sailing cupcakes came from somewhere wonderful in the blogosphere or one of my mom’s cupcake books. I can’t remember. 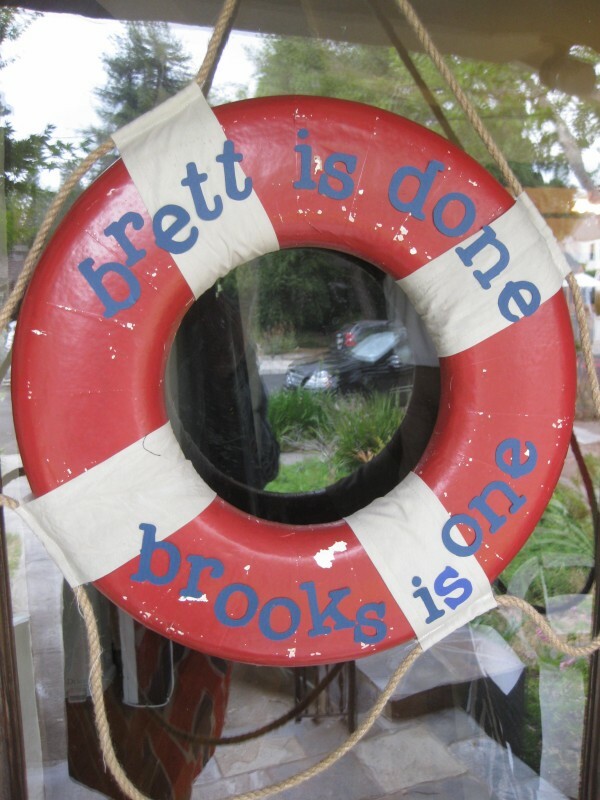 Both Brett & Brooks share the initals “BBL” so we put that on the sail and the water bottles. The lookout was a Reese’s peanut butter cup, the life saver was… well, a life saver! 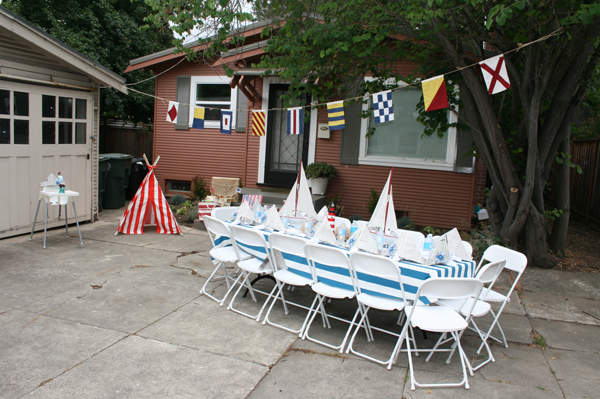 The nautical flags on our mantle spelled out “Brooks is one.” We greeted our family and friends with mimosas and then kicked everyone into the backyard. 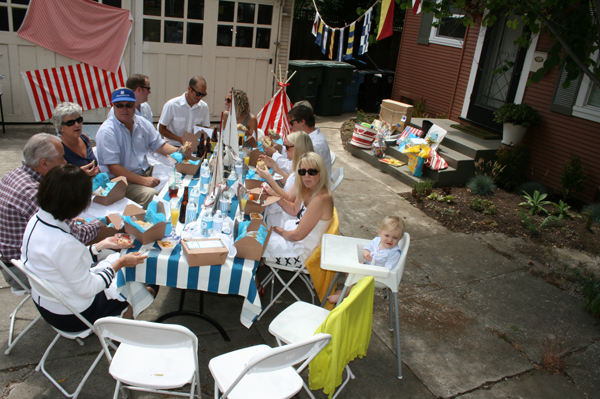 The night before the party, I had everyone fill out a ‘sandwich card.’ I made their croissant sandwich to their specifications the morning of the party, then boxed it up with pasta salad, potato chips, a tangerine, napkin, & fork. It was more work pre-party but once it started there was nothing to do! 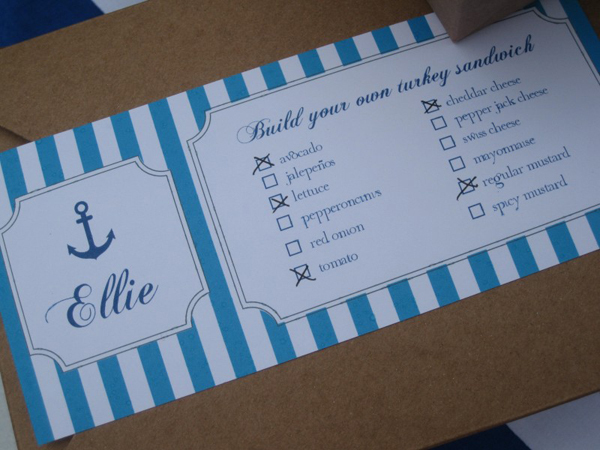 When it was time to eat, everyone just had to find their name and dig into their box! We kept the party super small which was nice because we all fit at one table. At the end of the party, this cute boy… …turned into this messy boy. 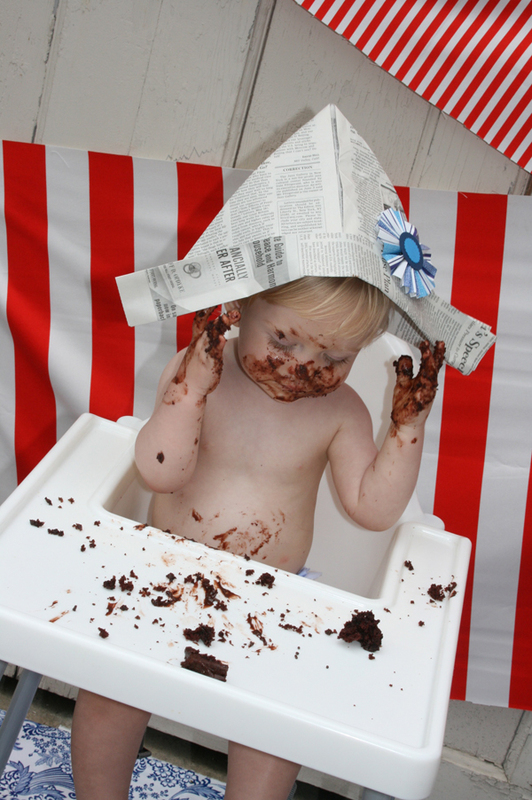 Who wouldn’t want to end their birthday covered in chocolate? Can you blame him? 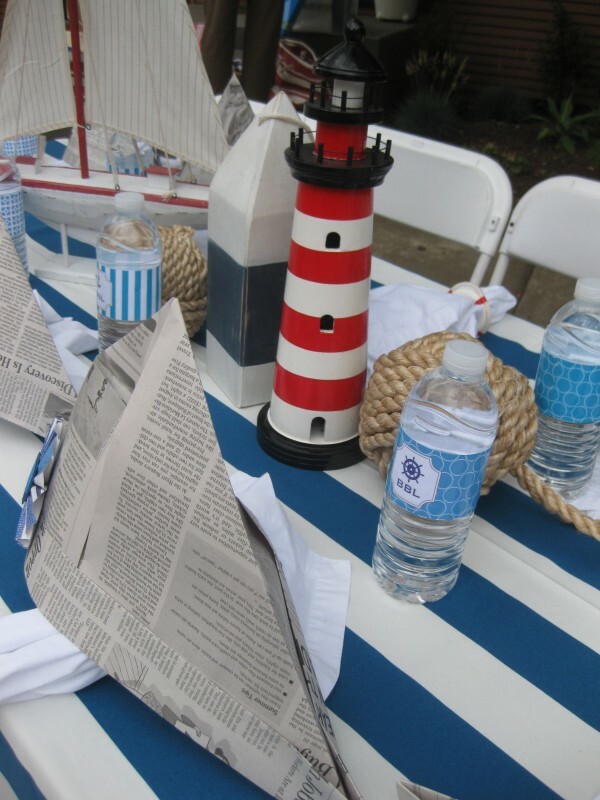 This entry was posted in kid's parties and tagged boy's birthday party, nautical birthday theme, nautical party, nautical theme party, sailboat party, sailing theme party by Annika. Bookmark the permalink. I LOVE THIS!! It looks like everyone had such a great time! 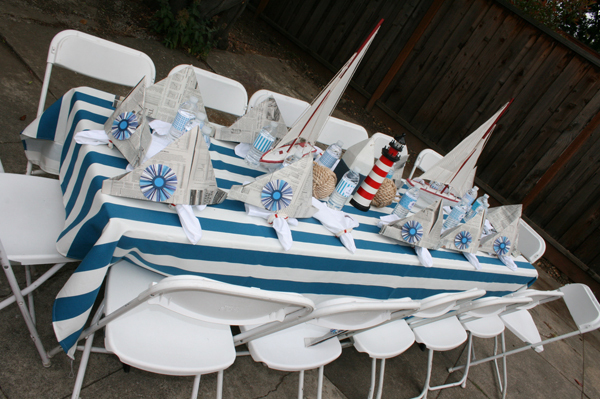 I am planning my son’s first birthday and might just have to steal some of your ideas for his sailboat themed birthday! 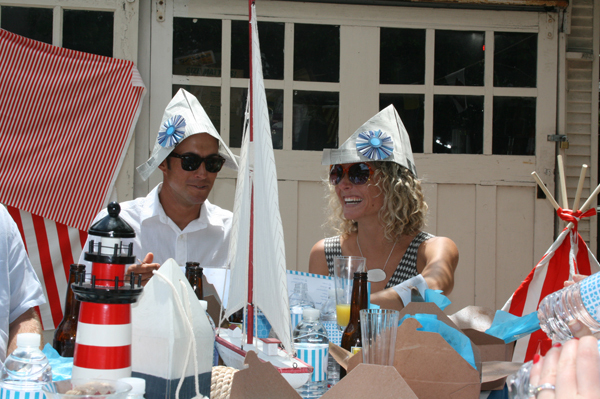 Really enjoyed reading this and what a great Nautical party. Great job of decorating and it sure looks like he loved the chocolate cake.